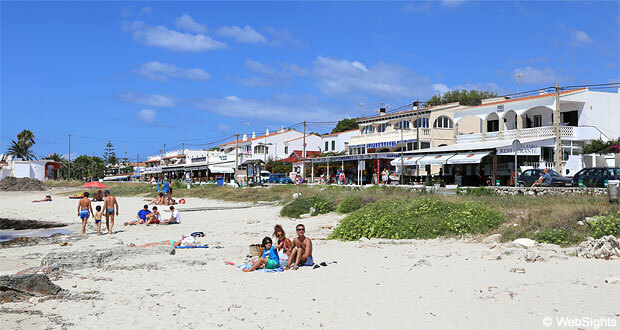 Punta Prima is located in the southeast corner of Menorca. 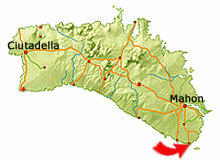 The distance to the capital, Mahon, is only 10 km and the international airport in Mahon is only 25 minutes away by car. 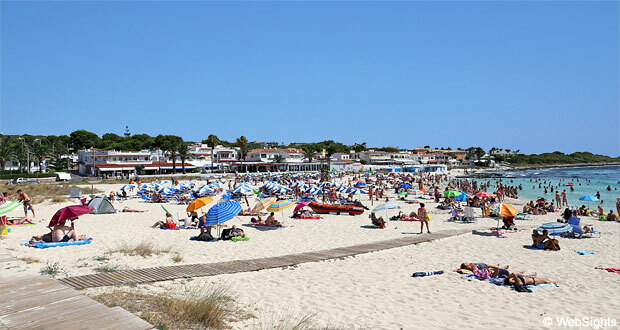 The nice sand beach in Punta Prima is located right in front of the small town centre. The beach is 150 metres long and very wide, so there is plenty of room for all. The water is clear and relatively shallow. The water has a sand bottom, but there are some low and flat rocks on both sides of the beach. The location inside a bay provides good protection against waves. It is possible to rent sun lounges and sunshades at the beach. Other facilities include showers and toilets. During the summer, the beach is supervised by a lifeguard. One kilometre southeast of the beach, you will find the island ‘Isla Del Aire’. 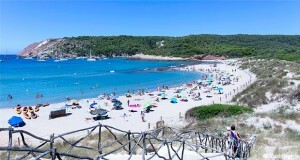 The island is home of one of the seven characteristic lighthouses in Menorca, which is easily visible from the beach. Isla Del Aire is also known for its very special inhabitants: the black lizards (sargentana negre) as well as several hundred rabbits. 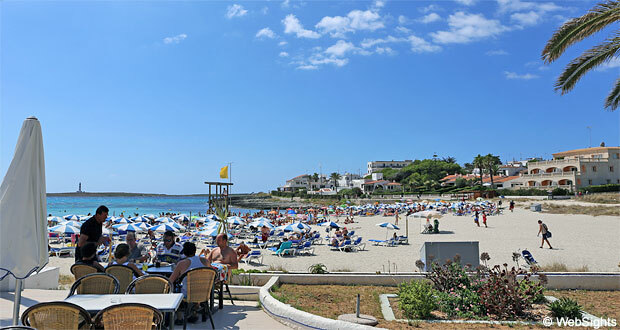 The beach in Punta Prima has shallow and usually quite calm water, which makes it very child-friendly. Less than 50 metres from the beach, there is a nice playground. There are no available water sports activities. 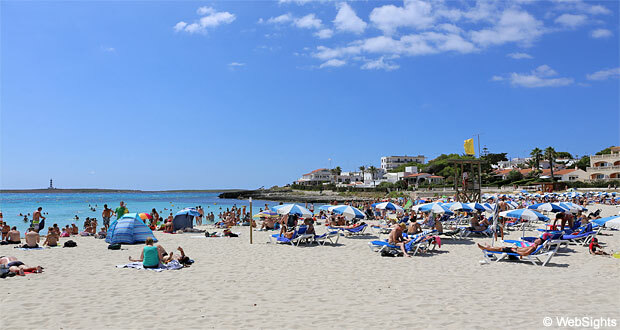 In the neighbouring town, S’Algar, there is a popular diving centre arranging diving and snorkelling trips. Behind the beach, there is a fine selection of restaurants, and particularly one of them has the most perfect view of the beach and the bay. Punta Prima is a medium-sized holiday resort with a few small supermarkets, some tourist shops and a fine selection of restaurants. It is a nice town and the atmosphere is quiet and relaxed. The town mainly consists of private holiday homes and apartments. 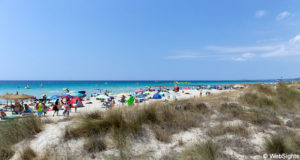 There are, however, also two large hotels: Insotel Punta Prima and Barceló Pueblo Menorca. Both hotels have four stars, large pool areas and plenty of activities for the entire family. 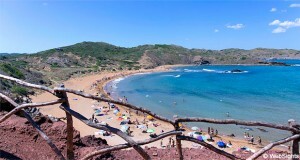 Punta Prima is located only 10 km south of the capital, Mahon, and there are several bus departures a day. In Mahon, the old quarter and the harbour lures with its intriguing shops, galleries and restaurants. The harbour is the second deepest natural harbour in the World.